Working only with the best of the best and seeking partners that continually work to change the world, AutonomouStuff has partnered with NEXCOM in its quest to be the global leader in supplying specialized product solutions and services related to autonomous driving, robotics, terrain mapping, collision avoidance, object tracking, intersection safety and a wide variety of industrial applications. 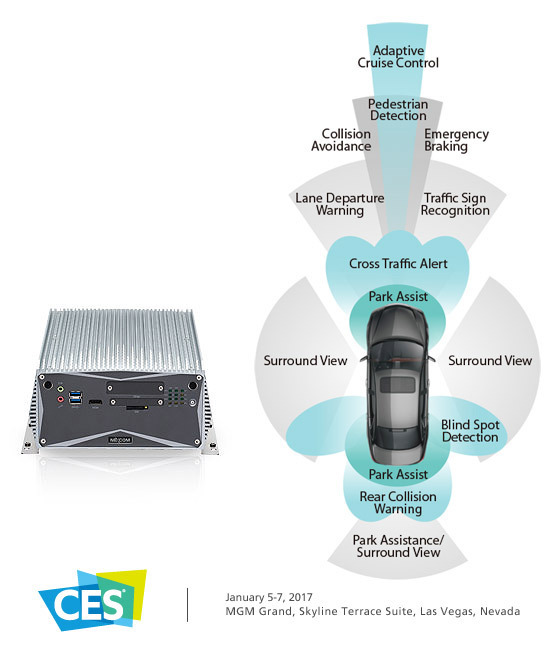 At CES 2017 in Las Vegas, Nevada from January 5-7, 2017, attendees will be able to see firsthand some of the best technologies AutonomouStuff has found to date, including NEXCOM’s NISE 3700 fanless computer. Powered by Intel® Core™ i7 processor, NEXCOM’s NISE 3700 is built for reliable performance in high electromagnetic, heated and vibrating environments. The fanless industrial computer meets EN 61000-6-2 and EN 61000-6-4 standards, and is equipped with heat sinks and anti-vibration dampeners to maximize performance and uptime. In addition, the feature-rich connectivity allows for use with LAN cards and sensors such as LiDAR, radar, cameras and GPS. “As AutonomouStuff brings autonomous driving technology from lab to reality, they need reliable suppliers with quality products and services to enable them to continue to innovate and productize their automated driving solutions. NEXCOM is proud to be a key partner with AutonomouStuff on the Road to Autonomy,” said Gale Lu, Sr. Business Development Manager, NEXCOM US. About AutonomouStuff: AutonomouStuff is proud to provide the world's most advanced organizations with the best products, software and engineering services to enable robotics and autonomy. The company was founded with the goal of bringing together the world’s best technologies to enable autonomy and increase safety. The top priority for the team at AutonomouStuff is customer success. Customers value the convenience of finding the most cutting-edge modular-based automation software solutions, engineering services, perception, computing, GPS and interface components in one location. AutonomouStuff now provides an entire fleet of R&D Platforms that serve as a safe and reliable way to test automation technologies.